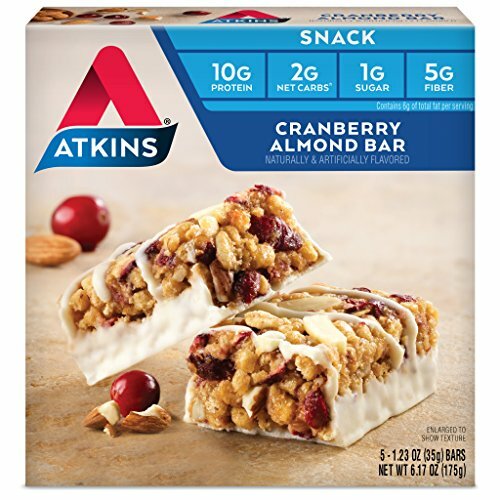 Home › Products › Health Care › Weight Loss › Bars & Snacks › Atkins Day Break Cranberry Almond Morning Snack Bar, 5 Count Bars, 6 oz. Crispy bar with tart-sweet cranberries, chopped almonds, sunflowers seeds and whole grain oats. Cranberries and almonds have always been great together, and this bar keeps the streak going. Crunchy granola, tart-sweet cranberries and tasty almonds. Good morning. THE ATKINS LIFESTYLE - The Atkins Diet and Lifestyle is the original leading low-carb plan that provides quick, effective, and balanced weight loss by limiting carbs and sugar to help the body burn fat for fuel and keep your energy steady. Over 80 published clinical studies support that the science behind the principles of the Atkins Diet produces effective weight loss and long-term health benefits. Say goodbye to counting calories with a low-carb lifestyle and make cravings a thing of the past. DELICIOUS WAYS TO STAY ON TRACK ANY TIME OF DAY - The Atkins product lineup provides easy and delicious snacks to help you live a low-carb lifestyle all through the day! Enjoy Atkins meals, snacks and treats at home or on the go for a delicious option with all the protein, fiber and taste you love, without slowing you down with extra sugar and net carbs. MEAL BARS: Nutritious and satisfying solutions when you don't have time to stop for a meal. Packed with protein and fiber, Atkins Meal Bars satisfy your taste buds as well as your hunger while providing the nutrition you need, no matter where the day takes you. SNACK BARS: Enjoy delicious Atkins Snack Bars at home or on the go. Packed with protein, fiber, and tastes you love.